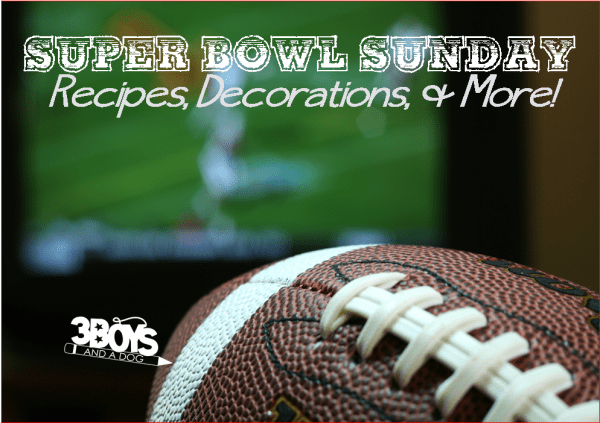 Over 100 Super Bowl Sunday Party Ideas: Recipes, Invitations, and Decorations! The Super Bowl is coming!! Do you have your colors? Are you prepared? I can’t imagine you needing anything else! Football Party Ideas: Recipes Your Guests Will Cheer For! 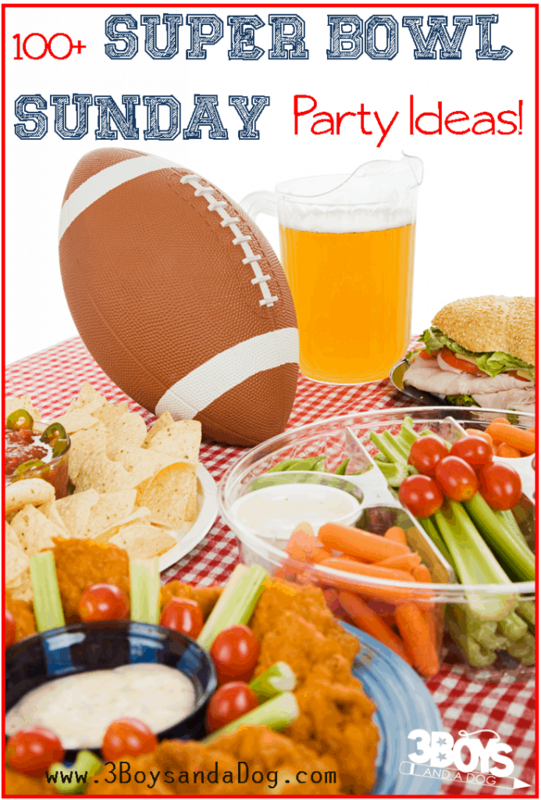 – Delicious recipes plus easy decoration ideas make this football themed party a winner! Over 15 Mini Dessert Recipes – No one wants to have to constantly server their guests during the Super Bowl – the commercials are just as good (if not better than) the game, so it is couch sitting for several hours. Thee mini dessert recipes make it easy for your friends and family to serve themselves! Five Ways to Ruin a Super Bowl Party – A Super Bowl party should be a fun event that everyone enjoys, remembers, and looks forward to repeating. Just in case you’re hoping to ruin a perfectly good Super Bowl Party! Easy Football Cake – This Easy Football Cake is the perfect addition to your game day menu! Moist Chocolate Cake topped with the Best Chocolate Buttercream EVER! Over 30 Sweet and Savory Popular Dip Recipes – Nothing says football party like a ton of dips spaced around the viewing area – right? Whether you want sweet or salty, this list is sure to help you fill up your Super Bowl Sunday menu! Five Perfect Super Bowl Party Food Ideas – Aside from the game, a Super Bowl party is all about the food! If you’re looking for a few winning Super Bowl party food ideas to feed your hungry hoards of football fanatics, this is the perfect spot! Super Bowl Dip Recipes: Spicy Slow Cooker Queso – Throw some spicy queso into the crockpot for an easy meal that cooks itself! 27 Super Bowl Sunday Appetizers – I have pulled together some of my top picks to help you complete your Super Bowl Sunday menu plan! Easy Coca-Cola + BBQ Slow Cooker Chicken – This easy and delicious slow cooker recipe featuring BBQ sauce and Coca-Cola is sure to please your guests! Great Football Home Decor For Super Bowl Fans – There are tons of football fans out there that throw elaborate parties for game day events, and these ideas for Great Football Home Decor For Super Bowl Fans are sure to fit the bill! Easy Super Bowl Invitations – These invites are super easy and super cute – what better way to get your friends to your house for Super Bowl Sunday? 17 Super Cool Super Bowl Party Decoration Ideas – What can you do to make your Super Bowl gathering more party-ish? There are lots of cute Super Bowl party decoration ideas that will ramp up your Super Bowl Party! Do you host the Super Bowl Sunday Party at your house? Great source! We aren’t hosting this year, but I do need to take something to the party. Thanks for linking up to #homemattersparty, I’ll be sharing this on my blog FB page! What a fantastic collection for the Big Games! Hope you are having a great week and thanks so much for sharing your awesome post with us at Full Plate Thursday. We look forward to seeing you again real soon! Wow! Lots of ideas to choose from! Thanks for sharing with us at Funtastic Friday! What a great list of ideas. I pinned them and will be using some of them soon. Thank you for sharing at Pinworthy Projects Party. Hi Kelli! So many great recipes! It’s all about the food! 🙂 Pinning for later! Thanks for sharing at Dishing It & Digging It! I look forward to seeing more of your creativity this year! Super Bowl Sunday parties are always exciting & I am sure it is so important to plan better for such big bash. These are some awesome party ideas which will be so much helpful for everyone of us. I’ll have to check them all out 🙂 Thanks for the list. I don’t have any plans but after reading this I feel like I should. I will make a festive dinner. These are great Super Bowl party ideas. I will have to use a few for our Hockey game nights. I love watching all the Super Bowl commercials. I will definitely be making the seven layer dip. Sounds really good and easy to make. My family loves dips! These are all great ideas. I can’t believe the Superbowl is in a week! I would love to make a football cake. I think that would be awesome! These are great ideas. We don’t do game days, but these are great for other parties, too. Wonderful ideas! My family and I enjoy hosting Super Bowl parties, especially when our favorite team (Dallas Cowboys) is playing. I don’t usually host a super bowl party. We usually go over to my in laws house. They had pizza and snacks in the past. Not sure what we are doing this year. Seriously amazing roundup! I think that the spicy slow cooker queso sounds wonderful! We are not huge foot ball fans here, gasp! I know! I am in need of slow cooker recipes for the week though and we love BBQ! I’ve been looking for a post just like this! My husband wants our Super Bowl party to be the best, so I’ll be putting these ideas to use. Thank you for this amazing ideas! I totally need more ideas for a perfect and fun super bowl parties. Thanks for sharing! Thanks for these ideas. Love the articles. All of them are great reads. The Coca-cola and BBQ Chicken slow cooker recipe does look interesting! I hate football but I LOVE throwing Super Bowl parties! Surprisingly enough, over the years I’ve found my shrimp ceviche to be the most popular dish I serve. There are so many ideas I want to try. I don’t think I’m having a party, but I will make a few just for the family to eat! One of my husband’s nephew always throw a big football party every year. These are some great ideas, I will pass this to him. Thanks for sharing this! We have a big Super Bowl party every year, but lately, it’s been feeling stale.